I used to cycle a a fair bit. When I lived in Bristol, I cycled to work every day. And I would explore miles of Avon's countryside or urban tracks. After I moved back to Leeds I continued to cycle to work; my weekly journey increased in distance two-and-a-half times, but I would sometimes catch the bus or the train if the weather was bad in the mornings (I hate sitting all day in wet clothes). On weekends when Gemma was at work, I would explore miles of Yorkshire countryside or urban tracks. But after we moved to our current house, I immediately stopped cycling to work, and eventually for a hobby. The centre of the city was now so close that I could easily walk to work; Gemma finished work to study and so no longer left me to entertain myself at weekends. And of course when Olive came along, my chance and inclination to go riding for a whole day was much reduced. Since going to Centre Parcs earlier this year, the embers of the two-wheeled getaway have been stoked. Conversely, I became bikeless at that time due to the terminal failure of my trusty mountain bike. Now, I've just bought a new bike. Last Friday, instead of walking home, I hopped on the airport bus and alighted at Kirkstall. Due to lack of stock at the much closed Killingbeck store, I had to pick up my new Apollo Phaze (urgh!) from the other side of town. At least this meant a slightly longer, slightly more uphill ride home - more practice for the rides we're going to be having with Andrew and Michelle. I've had time so far only to fit a bracket for Olive's seat, which means Gemma and I can share, or that father and daughter can go out for the day together. I need to get a stand, and I may think about getting a bike computer. We're just back from a five-day break to Center Parcs at Sherwood Forest. We shared a cabin with Andrew and Michelle and Scarlett. Also on site were the Balmponds (Dean, Rachel, Nathanial and Isabella), and Deb and Neil, Paul and Sarah, who also shared. An excellent time was had, the children in particular. We were very lucky with the weather, which (apart from the Monday) gave us blue skies and strong spring sunshine. If you've been before, you'll know that the setting is lovely, with the spacious accommodation hidden within dense, car-free, man-made woodland. We went swimming (in the 'Subtropical Swimming Paradise'), bowling, target archering and aerial adventuring. We cycled about the park (I had to hire a bike after my own irreversibly broke down after just a few minutes); Olive enjoying her new seat on the back of Gemma's bike. On the final evening we all went out for a meal, which was a semi-secret celebration of Paul's 40th birthday. Sarah put up pictures of him throughout the ages, sporting various embarrassing poses and outfits. The warm, (mostly) dry weather served up this bank holiday weekend has allowed us to had a packed three days. On Saturday, Gemma's mum's partner cashed-in his 50th birthday present from last year. We went over to Elvington (near York) to watch him drive a few laps in four different high-performance cars. I have no interest at all in fast cars, but I was on photography patrol so I couldn't take leave to explore the disused air field at which the event was being staged. Elvington apparently has a three kilometer long runway, and was home to the Free French Air Force during the second world war. It stopped being used by the RAF in 1992, and was most recently newsworthy for the 2006 crash involving Richard Hammond and a jet-powered car. On Saturday morning, Gemma had a text from our friend Sarah telling us she was currently in Leeds train station, heading to Hebden Bridge with her boyfriend Tom for a camping and cycling trip. And did we want to bob over to meet for lunch? Yes, we did actually. So Sunday saw us leaving the city for the winding up-and-down roads of the Pennines. I've never driven to Hebden Bridge before (I usually get their by train), and I didn't appreciate the potential difficulties in finding a parking space on a sunny bank holiday Sunday. Especially when one of the street signs directed drivers into a cul-de-sac, in which the car park has been taken over by a flea market. Eventually we found suitable vehicle abandonment space in a small (possibly secret) car park behind some shops and met up with our friends. We ate a pleasant lunch in the shady back yard of a restaurant called Mooch whilst catching up with each other (mainly comparing holiday destinations, a subject in which Tom and Sarah usually trump us), before drifting the busy streets. Ice cream was taken prior to our farewells, and we left Sarah and Tom to cycle the uphill four miles to their camp site. I'm certain you'll soon be able to read an account of their weekend over on their blogs. And bonus Monday saw us heading out of the house once again, this time south towards and through Wakefield and onwards to Nostell Priory. There, on the lawn in front of the house, we met Dean, Rachel and Nathanial, and Andrew, Michelle and Scarlett. Blankets and sandwiches were swiftly laid out, and we had ourselves a picnic. Olive ate and seemed to enjoy her first sandwich (Marmite). We then had a stroll around the grounds, and stopped a couple of times at the adventure playground (mainly for the kids, you understand). How icy was it this morning. I'll tell you - very. Actually, I can't speak for those of you outside central Leeds, but certainly my walk to work took 50% longer than usual as I edged, slid and picked my way gingerly across the pavements of my regular route, which had been transformed overnight into long, thin rinks. I had to use grass and road where I could, and conditions only eased in the city centre. Other pedestrians seemed to be similarly confounded, and a cyclist came of his bike on the loop road. My aural accompaniment this morning was a suitable episode of Excess Baggage, back on form after the return of regular host Sandi Toksvig. This week's program included interviews with snow tourist Charlie English and the delightful Simon Gandolfi, a seventy-three year old gent who rode the length of South America on little more than a pizza-delivery bike. 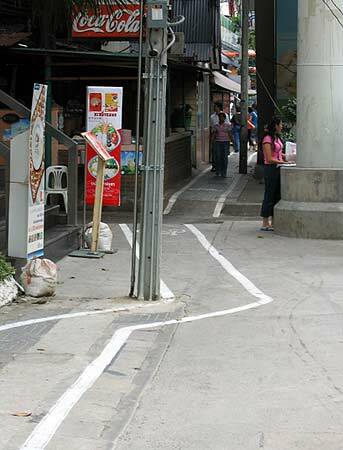 this cycle lane in bangkok appears to require a high degree of skill and patience. i think i would rather take my chances on the road. the chairman of leeds city council's scrutiny board for city development, brian cleasby, has been outlining his vision for his wish that everyone in leeds cycled to work, in conjunction with a kind of public transport renaissance. i like what he is saying, but i am pessimistic about the chances of his vision becoming reality. i have quite a choice when it comes to choosing how to get to work, five (realistic) options are available to me. each method has it's benefits, and it's drawbacks. i think the above results rule out driving - i can't afford £200 a month just to get to work. recently i have been catching the train, which i was surprised to discover is cheaper than the bus; a spare seat is rare on the bus or the train. the only way of guaranteeing a seat is to cycle. i walked once, but won't be doing so again in the near future. i chose my bike. my opponent, rather unfairly i feel, chose a bus. the venue was york road, the time was the morning rush. so, i was biking to work, and was in the bus/cycle lane opposite killingbeck police station. as i've said before, joint bus/cycle lanes are a stupid idea; the ones in leeds are in fact only wide enough for a bus, so a cyclist will hold up buses. also, bikes are too light to trigger the vehicle-sensitive traffic signals. anyway, i was aware of a bus being behind me, but then i heard a horn beeping at me, so i looked round to see the vehicle about two feet away from me - way too close. i held my course and speed - why should i be bullied of the road, i had just as much right to be there as the bus. at the end of the lane, we both needed to rejoin the main carriageway. i looked back, and was surprised to see the driver indicating that i should in fact be on the pavement. what? ignoring this wrongness, i continued down york road. the bus roared passed at a distance of about six inches; the driver had actually attacked me with his vehicle. i overtook him at a bus stop, but he caught me up at the junction of york road/selby road. here, normal traffic was stopped by red lights. bikes can continue to a second set of red lights, as i did. buses can exit the guided busway and also stop at the second set of lights. the bus and i arrive here at the same time - the driver madly steered into the cycle-only lane, and into my path, causing me to brake sharply. he opened his doors and said something like 'you cyclists, you ask for cycle lanes then you don't use them properly'. then he shot off, once again moving to the left into my path. i did nothing wrong, and he tried to run me down on four occasions. i made a note of the details, and as soon as i got to work, complained to first. 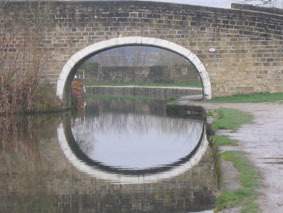 yesterday, to try to eradicate memories of friday's rubbish walk, i hopped on my newly fixed bike and headed west along the leeds - liverpool canal. i planned to go as far as keighley, and then catch the train back to town. 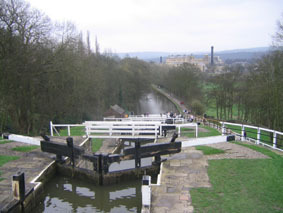 the day was overcast, but remained dry, and although the towpath was fairly busy, especially on the shipley - saltaire - bingley stretch, i made reasonably good time, completing the 25 mile journey in around three hours (including a lunch stop at the five-rise locks at bingley). i noticed a slight wobble in my back wheel yesterday, and when i put my bike in the rack at work, i did hear a worrying cracking noise, but decided to ignore it. after work, it was obvious that the wheel was totally broken, so i had to abandon two wheels and get the bus home. i collected the bike later in my car. i haven't had time to examine the damage yet, but i am seriously toying with the idea of getting a whole new bike, rather than patch this one up (again). exactly the same thing happened to my previous bike, only this time when i was pulling away from a busy set of traffic lights in bristol; then, i instantly ground to a halt in a bus lane, luckily nothing was behind me at the time.